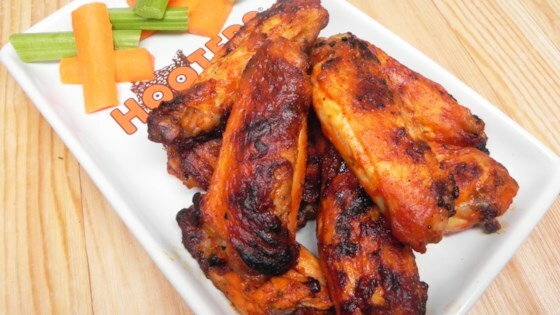 "Very simple hot, hot wings for grilling. Marinate your chicken in a simple hot sauce and grill up while basting those spicy wings with more of that sauce so that none goes to waste!" Place wings in a glass or plastic bowl. Pour hot sauce over the wings; cover bowl with plastic wrap. Marinate in the refrigerator, stirring occasionally to coat, 2 to 12 hours. Place wings on the grill. Cook, occasionally turning and coating with leftover marinade, until chicken is no longer pink in the center, about 10 minutes. Continue grilling and turning until browned, 5 to 7 minutes more. Crystal® Buffalo Sauce may be substituted for the "Louisiana" Wing Sauce.